UAF say EDL got 1000 out, it doesn’t look like much on footage, but Casuals United blog predictably says it was 2000, so lets call it 1500. EDL Groups from all over country bused in – probably got more out than in Tower Hamlets, but that’s because lots of these brave ‘patriots’ shat themselves at the prospect of walking into the east end. EDL announced that Dear leader Tommy was going to be the new Deputy Fuhrer of the Brittish Freedom Party. EDL Deputy Kevin Carroll gave a very strange speech in which he called for George Galloway to be hung for treason, and said that all English people should make their kids wear crosses…Dunno what the atheists kids will wear though, if that’s even allowed under Tommy & Kevin’s regime. Reports of the EDL crowd being shitfaced are everywhere & apparently scuffles with police broke out at the front of the EDL march with bottles, cans, fireworks and a smoke bomb being chucked at police. 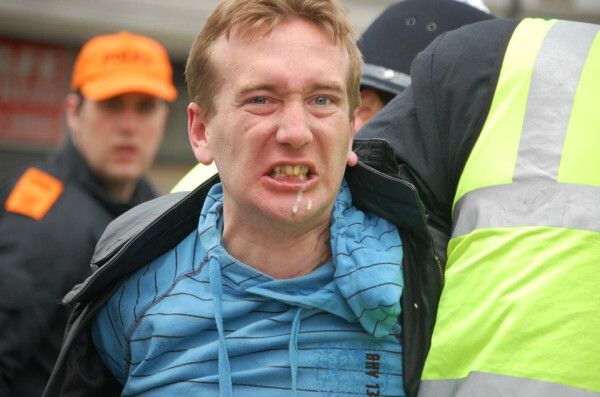 Presumably fighting with police is the EDL way of saying thank you for saving them from a wooping in Brighton. Police have given out leaflets telling people not to mask up. No reports yet that anyone in the local community have suffered injury. Full report to follow.